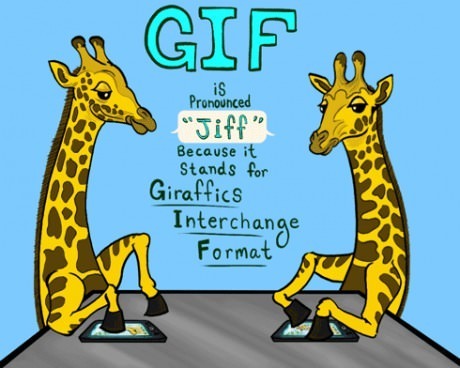 JIF vs GIF - The Pronunciation Of The Acronym, "GIF"
First of all, who the F^ck cares!!! But now that I’ve gotten that off my chest, I have to jump in to the argument because the fact that a lot of people REALLY DO CARE!!! is hilarious to me. 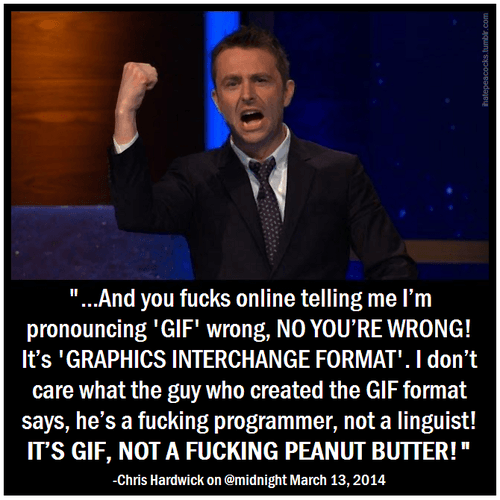 In fact any time that people get really crazy about things that don’t matter at all, it makes me laugh. I say let’s give them some guns and knives and let them fight in out until there is only one left… Then we can tell that one person left that he or she is wrong – and joyously applaud as that person’s head explode. Aphorism: “Don’t Bite Off More Than You Can Chew!” | GiveMe SomeEnglish!! !